Essentially every branch of the automotive industry — or most skilled blue-collar jobs for that matter – have industry recognized minimum standards before someone can qualify for certain skilled trade positions, because earning these specific titles requires a higher level of knowledge beyond your average high school graduate.For many of the trades found in your local performance shop such as EFI calibration or engine building, you may be surprised to learn that minimum standards don’t exist and it’s not uncommon for the only source of training to be from places like internet forums, YouTube videos and friends or family, where separating fact from opinion is nearly impossible — EFI University was created to fill that void. With more technical crafts like EFI tuning, it can be difficult to verify the calibrator’s training or skills and you often just have to take them at their word and that of their “fan boys.” Far more often than most probably realize that “professional” shop might have had deeper pockets or more connections, but not necessarily the most skill or proper training. That presents a number of potential problems that have already left far too many gearheads with a lighter wallet, with nothing to show for it but a paperweight in the shape of an engine. As engine technology continues to become more advanced and aftermarket ECUs more technical, the problem will only continue to get worse. EFI-U wants to change that, and with some of the biggest manufacturers in the industry backing the school in their endeavors such as AEM, FAST, Garrett, Haltech, Holley, Mainline Dyno, Nitrous Express, Turbosmart, and more; so their reputation really speaks for itself. Real professionals know that first understanding why your engine demands a specific amount of air flow, ignition advance, or fuel will provide you with the tools required to figure out the whats and wheres on your own — then you can really calibrate any engine. I recently spent some time at EFI University’s headquarters in Lake Havasu City, Arizona, to attend the school’s five-day-long Accelerated Certification Program (ACP). ACP is a “boot camp-style” course that combines EFI-U’s introductory EFI 101 course and Dyno Tuning Workshop (DTW), covering engine and aftermarket EFI theory, as well as some electrical theory, tools of the trade, and of course calibration techniques. On top of all of this, you will also have access to more personalized hands-on dyno time and personal instructor dialogue than you could ever imagine from a program like this. At the end of the course you are given a written exam, and if you pass the exam you will receive your “High Performance EFI Tuner” certification. Outside of what is covered in the classroom, one of the greatest benefits to the course is the fellow enthusiasts and industry professionals you have the opportunity to network with. Before walking into the classroom on the first day I was admittedly nervous, especially as someone representing an engine tech and theory magazine. I couldn’t help but worry — Who else would be in the class? Would I fall behind? What if I don’t immediately grasp something that the rest of the class does? Is the instructor patient? Sure, I’ve worked in the performance automotive industry as an independent EFI tuner and mechanic for a number of years now, and of course as a writer for EngineLabs, but I like to live by the idea that no one can truly know everything about a subject and you can never learn too much. And after attending EFI University’s ACP course, that belief was solidified in me. This program offers the ultimate experience for both beginners and professionals alike to invest in their own worth and absorb valuable technical knowledge that can be used to further a career and expand their professional network, grow an existing business, or simply learn a new hobby after retirement. 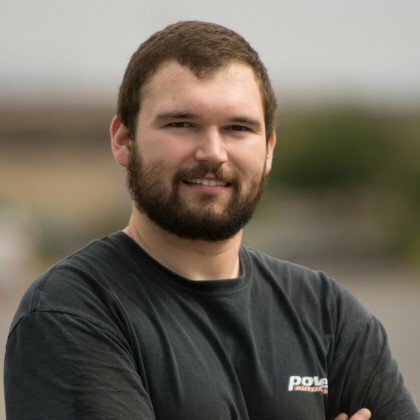 The point is, ACP has more than enough to offer for anyone from any background, and I can say without a doubt that this course permanently altered the way I look at an engine, and through hands-on objective learning, I was given the tools to become a better and more confident EFI calibrator, mechanic and technical writer. Ben Strader (left), founder of EFI University, presenting me (right) with my High Performance EFI Tuner certification after passing the written exam at the end of the intensive five-day-long program. The topics covered in this class are very technical, so technical in fact that each class is limited to just six students — who travel from all over the world to attend! We felt that it just wasn’t possible to relay the true value of this program through a generic overview, so as a result, we decided that it would be much more interesting if we pulled several of the topics actually covered in the program and presented them in a series of articles. Just remember, we really think you should take the course yourself, so we can’t give away all of the answers! How Much Air Will It Take To Meet The Horsepower Goal For Your Engine? Just remember, air is technically a fluid and is measured as such. The first topic we want to cover is one of the first things you will go over in the course; if you have an engine and a horsepower goal, how do you calculate what the engine will need to get there? The answer is not exactly simple, but power output is directly related to Mass Airflow, mechanical efficiency and thermal efficiency (fuel). ACP students Jose Rodriguez (left), a retired police officer from Florida; and Miguel Beltran (center), a smog shop owner from Southern California looking to expand his business; being walked through the process of calibrating a VE map by EFI-U instructor Seth Francis (right) before giving them free rein to calibrate the VE table alone. “Whether you’re building an LS, big-block Chevy, small-block Ford, a Gen III Hemi, or an inline-four import is irrelevant,” says Ben Strader, founder of EFI University. “The reality is that what you’re looking at is nothing more than an ‘air pump,’ and we have to move X-amount of air to make X-amount of power.”For example, let’s say you have built a 302ci small-block Ford and a 454ci LSX, and both have a goal of 800 horsepower with an 8,000 rpm rev limit, at sea level, and using the recognized standard air pressure at sea level of 14.7 psia (101.3 Kpa) and the standard air temperature for sea level of 59 degree F (15 degrees C). To start, if we want to calculate Mass Flow we first need to find the Volume Flow (CFM) capabilities of each engine and the Air Density(pounds/cubic ft) they will be operated in. For theoretical calculations such as this we assume 100 percent volumetric efficiency (VE) in naturally aspirated form, which we know is extremely difficult to achieve, but still gives us a very close estimate of the engine’s capabilities. So, assuming 100 percent VE at 8,000 rpm, our small-block Ford can theoretically flow a maximum 699 CFM and our LSX can flow up to 1,051 CFM. ACP students Guilbert Apresto (left), a road tuner from Guam; and Uriel Castillo (right), a technician from Mexico; taking turns using what was learned from the classroom and live instructor demonstrations to get comfortable operating a vehicle on a chassis dyno and recalibrate the school’s Haltech powered Toyota Yaris dyno mule. Air Density is one of the most important aspects when it comes to accurately measuring how much air actually moves through the cylinders. To find Air Density, first we need to know the absolute air pressure and the absolute air temperature of the engine’s environment, which in our case will be the recognized sea level standards of 14.7 psia (101.3 Kpa) and 59 degrees F (15 degrees C).It’s also important to account for what is referred to in most scientific circles as the scale height, or the distance over which a value decreases by a factor. In our case, this is the factor by which atmospheric pressure decreases as elevation increases, which on Earth is a factor measured from sea level to the peak of Mt. Everest and is recognized as 2.7. Our work tells us that with a standard sea level pressure of 14.7 psia (101.3 Kpa) and 59 degrees F (15 degrees C), air density measures out to 0.0764 pounds/cubic feet. “With this information we can then use our ECU to incorporate math formulas, along with a direct measurement of Air Density, to create real time corrections for fuel and spark trims to accurately compensate for changes in elevation or air temperature,” says Strader. This tells us that our small-block Ford will move 53.40 pounds per minute while the LSX is capable of flowing 80.30 pounds per minute. ACP student Lester Lumanog (right), a Marine and firearms instructor from Nevada; having an open discussion with founder/instructor Ben Strader (left) during the classroom portion of the program. If we measure the engine’s airflow using Mass Flow units (pounds/minute), then use the formula in the sidebar, we can estimate the maximum horsepower each engine is capable of producing for each pound of airflow.Since both of our theoretical engines are “built,” (and to keep things simple) we will assume that both have a BSAC of 10 — which for this scenario means that they will produce 10 horsepower for each pound of air moved per minute. Depending on the platform and build specifics, your engine may be higher or lower than what we chose, and ACP will show you how to calculate it yourself. Using the Mass Airflow values we calculated earlier, we can multiply by our BSAC of 10 to find the engine’s theoretical maximum horsepower capability. So according to our calculations, the naturally aspirated 454ci LSX just barely meets our power goal of 800 horsepower at 8,000 rpm. As I’m sure some of you expected, without a miracle the smaller displacement Ford doesn’t even come close and will definitely need a little help in the form of forced induction, which then leads us perfectly into Part Two of our series. As a results we will be introduced to the school’s Advanced Turbo Concepts (ATC) course into the mix — which is available independently or as an additional course for ACP students. Keep an eye out for Part Two and Three of our EFI University ACP/ATC crash course. For Part Two, we will be diving into the world of turbochargers to see how much boost it will take to get our 302ci Ford to 800 horsepower. Then we will have all of our airflow requirements out of the way and can finally work on the fueling needs of both engines.